Disruptive trends like artificial intelligence or big data impact project management substantially. Therefore, PMI says we need to develop new ways of working and invest even more in proven PM practices. PMI’s most recent Pulse of the Profession is about how to succeed in a disruptive world, with challenges being, among others, new technologies (like autonomous vehicles), artificial and data intelligence and big data. Also, it stresses the importance of investing in skilled and experienced project managers to meet these challenges and become one of the champions in project management – meaning that at least 80% of your projects are completed on time, on budget, meting business intent, and having high benefits realization maturity. 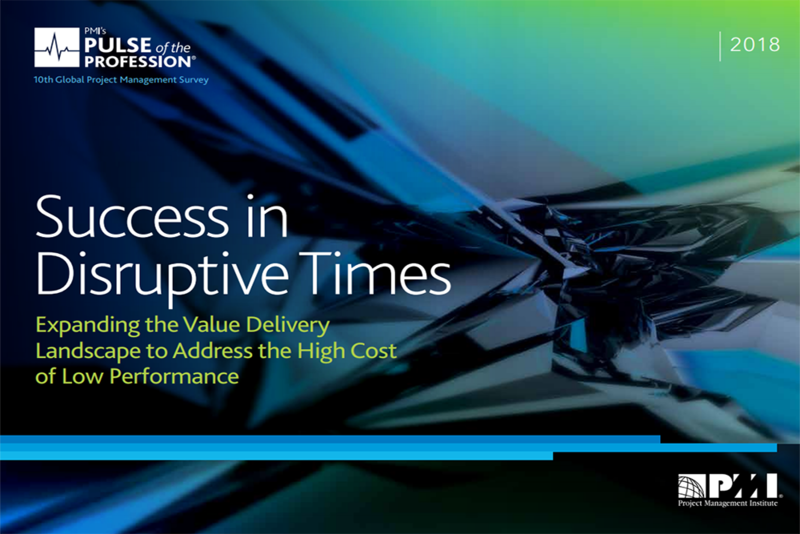 On the other side are the so-called “Underperformers” – organizations with 60% or fewer projects being completed on time, on budget, meeting business intent, and having low benefits realization maturity. Conducted since 2006, PMI’s Pulse of the Profession® is the premiere global survey of professionals who provide project, program, or portfolio management services within global organizations. The Pulse charts the major trends for project management now and in the future. It features original market research that reports feedback and insights from project, program, and portfolio managers, along with an analysis of third-party data. The 2018 edition of the Pulse highlights feedback and insights from 4,455 project management practitioners, 447 senior executives, and 800 project management office (PMO) directors from a range of industries, including government, information technology (IT), telecom, energy, manufacturing, healthcare, and construction. Respondents span the North America; Asia Pacific; Europe, Middle East and Africa (EMEA); and Latin America and Caribbean regions. The analysis in this report and other outputs from this project, also draws on the insights of interviews with eight corporate leaders and eight PMO directors. Industry and regional comparisons are available on PMI.org/Pulse. Only 58% of organizations fully understand the value of project management. The importance of fully valuing project management cannot be emphasized enough; organizations that undervalue project management as a strategic competency for driving change report an average of 50% more of their projects failing outright. Implications for project management in a changing environment can be seen in areas like data collection, reporting, monitoring, and information sharing. Developing digital-era project management skills is important to champions (31% versus 15% of underperformers), and we expect to see the focus grow as new technologies emerge. Furthermore, the study shows that organizations investing in key principles in project management and training project managers waste significantly less money due to poor project performance—21 times less, or only 1.4% of every dollar wasted versus 29.1% for those who don’t pay attention to their project management capability. Organizations are able to reinvest that savings into other areas—allowing them to move faster, produce more, and achieve greater success. The key to successful project management, the report says, is investing in actively engaged executive sponsors, avoiding scope creep or uncontrolled changes to a project’s scope and maturing value delivery capabilities. Effective project sponsors use their influence within an organization to actively overcome challenges by communicating the project’s alignment to strategy, removing roadblocks, and driving organizational change. With this consistent engagement and support, project momentum will stay steady and success is more likely. There are a number of ways to control scope, regardless of approach. These include creating awareness of the business benefits, establishing a credible feedback loop with the customer, and taking iterative approaches, allowing for shifts in delivery midstream. These lead to more deliberate shifts in scope based on informed business decisions. Success is greater when teams listen, learn, and are adaptable. Value delivery capabilities are the full spectrum of competencies that enable organizations to deliver their projects and programs. Maturing these allows for quick adaptation to changing market conditions by balancing efficiency and creativity and promoting continuous improvement. Again, we see that champion organizations are making the investment and have high delivery capabilities maturity—87% versus 5% of underperformers. Their goal is to deliver better benefits, adapt to change, and achieve customercentricity—all for continuous improvement and better outcomes. Pulse of the Profession 2018: Success in Disruptive Times by Managing Projects Effectively - InLoox • Copyright 1999-2019 © InLoox, Inc. All rights reserved.